The Delhi Wine Club dinner at the Italia Restaurant was electrifying experience with the roar of club members enjoying Italian wines with excellent food and joining the roaring crowd next door cheering the Indian team, well prepared with extra bottles of Prosecco organised by President of the club, who was as optimistic about India beating the Aussies as every successful wine event of the club, writes Arun Batra. 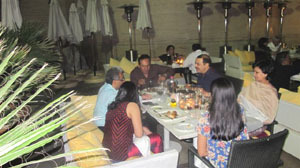 Most wine dinners of the Delhi Wine Club usually involve some hectic behind the scenes activity by the Club President Subhash Arora in ensuring that the wines for the dinner arrive in time at the venue. Liaising between the importer, the local distributor (who gets the wine de-bonded and arranges the Transfer Permit through excise) and the couriers/transporters is a headache which comes as part and parcel of organising a wine dinner. However, organising the wine for the 4th get-together of the calendar year and the 175th since its inception, proved to be a different and more difficult kettle of fish. With the month of March being the last month of the licensing year, the duty hassles led to what Subhash terms as “the longest wine chase in the history of the Delhi Wine Club”. And that was no passing reference to cricket –as luck would have it, India set up a do or die quarterfinal final clash with Australia on the 24th March –the evening of our wine dinner at Italia Restaurant at DLF Promenade, Vasant Kunj! Despite the promise of handpicked wines and choice dishes selected from the new menu at this casual fine dining venue, there were cancellations from members who wanted to focus exclusively on the cricket. Nevertheless there were well over 30 members who showed up and as you will read later on were not too far away from the action on the cricket field-except that they always had a glass of wine while watching the Indians inching towards the semi-final! 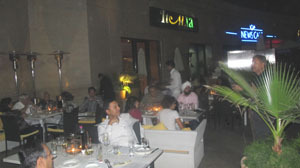 Italia Restaurant, owned and run by the Park group of hotels- a strong supporter and designated as a ‘Friend of the Delhi Wine Club’ was were very kind to offer us exclusive use of their open air outdoor terrace which offers a choice of lounge as well as table seating amidst a profusion of greenery. Italia didn’t have a TV, but the beautiful weather outside and the two huge screens put up by the next door News Café on the adjoining part of the terrace ensured that the evening was pleasant and electrifying with members getting regular updates on the score. As the second half of the game got under way, so did our dinner with an aperitif of the Prosecco Carpené Malvolti DOC 2009 to accompany a plethora of finger foods that came our way frequently and in abundant quantities. The Prosecco, produced from the Prosecco grape in Conegliano, the capital city of the 22 km long sparkling wine producing belt, 40 kms north of Venice- as Subhash informed us while sharing his experience about a visit to the winery a few years ago, was a pleasant aperitif with apple being the dominant note .Definitely one of the better Proseccos I have tasted and I thanked my lucky stars I was on time so I could get a couple of refills of this very palatable sparkling wine before we sat down for the 5-course menu. Moving on to our dinner seats, we next encountered the Soave Classico Allegrini Pagus DOC 2009 – a product of the Corte Giara project started in the winemaking district of Valpolicella by the renowned Allegrini family to deliver “high value wines for everyday drinking”. This Soave, from a base of the Garganega grape did not deliver the winemakers philosophy with its sharpness highlighted by a weak nose and lack of a fruity mouth feel. The chef did a good job on the chilled tomato basil soup and did even better with the Duck Confit with goat cheese and rocket leaves. The Pear and Walnut salad disappointed slightly, with a weak representation of gorgonzola to offset the sweetness of the pears. To match with the appetizers, we had from the Collio region in the north-eastern part of Italy, bordered by the Alps to the north and the Adriatic Sea to the south, the Attems Pinot Grigio IGT 2009 – a lively wine with an overtone of peaches and with a silky mouthfeel -so typical of the Pinot Grigio grape. Next door the cheers of the crowd were getting more and more vociferous as they glugged their beers and watched India march inexorably on towards their target. We now went on to the red wine section of the evening – a selection of lighter reds keeping in mind the weather. The Frescobaldi Chianti Castigloni DOCG 2008, a predominantly Sangiovese wine with a 10% blend of Merlot ,was packed with fruity aromas and had supple tannins to match the acidity ,though this wine would have benefited with some more interaction with the atmosphere in order to live up to its DOCG billing. Nevertheless, it put the accompanying pedestrian potato gnocchi totally in the shade. The buzz from the nearby cricket watchers had by now turned into a roar with the prospect of India winning becoming a reality as Subhash instructed the staff to quick-chill the bubbly in anticipation of a victory. Coincidentally, the arrival of the Lucente 2006 was heralded by loud excited vocal support from the cricket choir next door. A blend of 50% Merlot, 35% Sangiovese and 15% Cabernet Sauvignon translated into an elegant beautifully balanced wine bursting with aromas of cherry and plum which continued on into the finish. Truly the star of the evening, this wine was applauded by all and was truly deserving of its 91 points rating by the Wine Spectator. Both the mains, the rack of lamb and the salmon fillet, were well prepared though I personally would put my hand up for the salmon. Unusual for salmon prepared by an Indian chef, the fillet was juicy, moist and not overcooked to dryness thereby retaining its flavour –arguably some of the best salmon I have had In New Delhi, not to mention the perfect condiments. And yes, I must admit probably to the chagrin of the purists, that the Lucente went better with the Salmon than with the Lamb rack. By this time India had won the match and it was time for the club members to voice a roar themselves as they applauded Subhash Arora who had stashed away a few extra bottles of the bubbly and pulled them out to toast not only the Indian team, but also Vikas Saharawat, Manager F&B and his team for a truly enjoyable evening of fun and food, courtesy our official thanks-giver David Briskman. 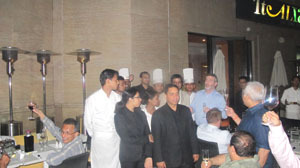 Kudos to Debjit Banerjee, the F & B Director of the Park who monitored the activities from Menu to Venue closely and was present at the restaurant along with the Park Executive Chef Anurudh Khanna to ensure that the members had a memorable experience of Italian cuisine. Driving home that night, I reflected on the versatility of the Prosecco and decided I must use this forum to propose to our Club President Subhash Arora, the possibility of having a wine dinner with only sparkling wines- be it Champagne, Prosecco or Cava.